1990 became the youngest ever winner of the biggest prize in comedy the then Perrier Award at the Edinburgh Festival. In 2012 his Stand Up is really flourishing with the vigour of old and it is a great honour to host a true legend of Stand up. 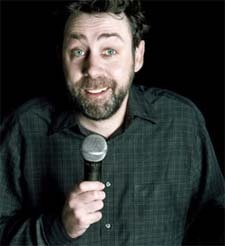 Séan has two very different shows at this years Edinburgh and what we will get is a mix of both those already critically acclaimed shows, one of which is focused around the death of his father. It promises to be a very special evening spent with a true legend of comedy. not one but two Perrier Award winning comics. 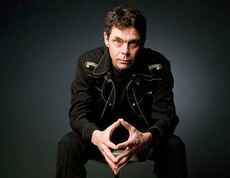 FICBCN 2012 will bask in the glow of absolute comedy legends as we welcome the king of deadpan and the biggest American comic working in the UK, RICH HALL!!! The giggling Guiri has been pursuing Rich for 7 years and finally he has found time and succumbed to relentless pursuit to give Spain a taste of one of comedy's true legends. We are delighted to announce we have made the incredible Logan Murray Intensive Workshop a fixture of FICBCN. Each year the workshop culminates with a show comprised from the participants sets that will have being sculpted in the 3 days workshop. The show is handled by Logan, himself a comedy performing veteran with over 2 decades experience in the game. The last 2 of these shows we have staged were unbelievable acknowledged in the standing ovations received. It is a brilliant, unpredictable night of a guaranteed over 10 acts led by the guru himself. At just €10 it is an awesome night's entertainment at incredible value!! The grand Final of BCN FIC's first ever amateur comedy competition will comprise the 6 best sets from the 3 heats taking place around the city over the festival. It makes for a night of certain unpredictability, nerves and competitiveness generally the ingredients for comedy gold. There are prizes at stake and we firmly believe Barcelona is hiding a comedy nugget. Local stand Up comedy outfit S.U.C.K have been presenting regular shows normally priced at €5 (with a free drink) throughout the last year. The S.U.C.K gang want to take the opportunity of the festival and heightened profile to spread the word and let people know there is a local Stand Up collective to support, enjoy or join whatever you're preference. add your name to the list. There may be a few very special surprises! Brace yourself for an evening of unpredictable madness; B.I.G. is the Barcelona Improvisation Group. A committed (!) team of English-speaking improvisation pros from all over the world have ganged together to put on a wild night of comedy - where anything and everything can happen. And they need YOUR strange brainwaves and suggestions to help put on each hilarious and unscripted show. Well it made it and from a night that began tentatively 12 months ago and took 4 shows or so and a committed core of storytellers and fans who 'believed' to get it over the line. You can all now take a bow. You were all part of what steadily grew under the enthusiasm of one of BCN´s best loved guiri performers Stephanie Figueira and is now firmly established as one of BCN´s coolest live entertainment happenings. This will be a very special VENT! as we choose at least 6 of the funniest stories from these last 12 months which will be recorded to go global via one of New York´s best loved storytelling podcasts Risk! There has been something of serendipity about the way this night has come together as NY comedian/DJ Danny Lobell (so brilliant in the GG in 2010) was hosting an online chat show featuring RISK! creator Kevin Allison and our own Juan D. Ablo to the surprise of himself and the rest of the chat show. After figuring out who Kevin was and that they had both essentially had done very similar things on each side of the Atlantic, in 2 of the world´s very coolest cities, well it seemed an obvious conclusion to do something together. RISK! is focussed (very successfully) on Podcasting so it seemed a good platform for VENT! to get its head out of its cellar bar comfort zone. Its a comedy festival and so a selection of the funniest stories of 2012 will be recorded for the RISK! podcast and take VENT! global. This is a one off (there will be more) VENT! for which we will be charging a nominal €3 to pay for transatlantic production but the night will revert back to its unrecorded usual free to public format for a new season preserving the magic of the moment and the stories... at least for now, but once the world finds out, who knows! !